It all began in 1967. As legend goes, Oscar Riedener, vice president and design director at Tiffany & Co., sat down for lunch with NFL Commissioner Pete Rozzelle in New York City. That day, the two men started a collaboration that would last 50 years and one that would create the most coveted trophy in sports history: the Vince Lombardi trophy. Reynolds said the process of making the Super Bowl trophy has not changed from the turn of the century. 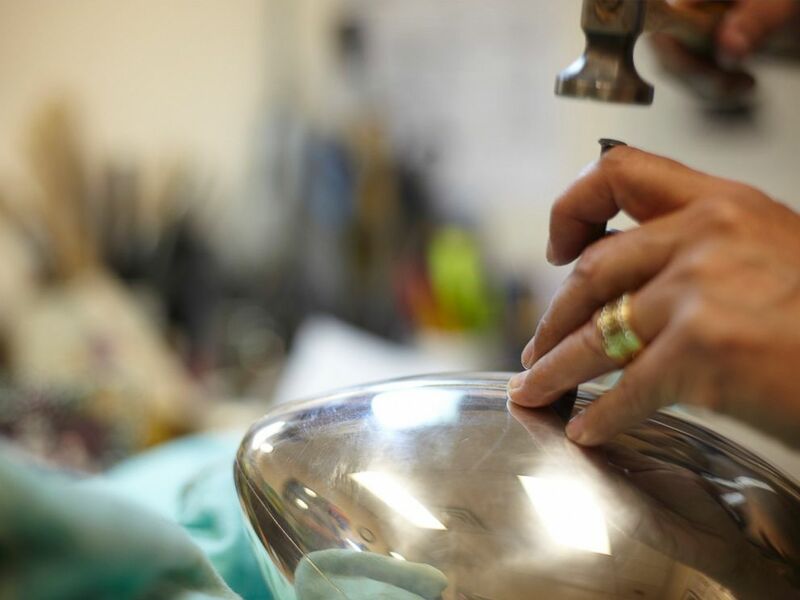 The American jeweler’s silversmiths in Rhode Island hand solder heavy sheet silver, spinning, chasing and polishing the metal to create the 22-inch, 7 pound trophy. The whole process takes four months. PHOTO:Tiffany has created and produced the Vince Lombardi trophy every year since 1967. The trophy, which is hollow, features a regulation-size football in kicking position on top. A new trophy is made each year though the design has remained the same. After the Super Bowl winner is determined, the confetti is cleaned up and the fans go home, the trophy is returned to Tiffany to be engraved -- and scrubbed clean. The Super Bowl winner, date of the championship game and final score are engraved on the trophy. Some teams prefer to keep the engraving simple; others ask Tiffany to include all the players’ names. The trophy was named after Vince Lombardi in 1970. Lombardi, the revered football coach for the Green Bay Packers, led his players to victories in the first two Super Bowls. Tiffany has also been commissioned to design and make Super Bowl championship rings for several teams, including by the New York Giants, the Seattle Seahawks and the New Orleans Saints. The Lombardi trophy may have the most cachet, but the 179-year-old jeweler has also been the design force behind the World Series trophy, the MacArthur Bowl trophy (commissioned by the National Football Foundation and given to the best college football team as selected by the foundation), the NBA’s championship trophy (re-named the Larry O’Brien Championship Trophy), the Samuel Rudin trophy (given to both the male and female winners of the New York City marathon), the U.S. Open Tennis Championship trophy, the NASCAR NEXTEL Cup, among others. Right now, football fans can get their photos taken with the Lombardi trophy at the NFL Experience in San Francisco’s Moscone Convention Center. The trophy will be moved to Levi’s Stadium in Santa Clara, California, on Sunday, where guards will assiduously watch over it before it's presented to its new owners. Tiffany, of course, will happily polish the silver trophy just in case it becomes tarnished.